Steampunk conventions have been equated to historical world’s fairs and exhibitions of the 19th century, with cons donning monikers such as “Steampunk World’s Fair,” “World Steam Expo,” “International Steampunk City,” and “Steampunk Industrial Revolution” just to list a few. These conventions also feature programming reminiscent of the Victorian era: demonstrations of 19th technology and engineering and cultural topics, lectures about topical Victoriana subjects, and artistic and recreational performances like high teas, circus acts, hot air balloon rides, burlesque, and variety shows in imitation of the entertainments from that period. Modern activities are also incorporated: rock and hip-hop concerts by steampunk musical groups, retrofuturistic-themed costume contests and fashion shows, suites to play video games or role-playing games, tweed bike rides, and of course, room parties among attendees late at night. These modern additions are also staples that are seen at other fan-run conventions from different fandoms; likewise, this influence has affected the demographics of steampunk convention attendees. Many of them are also regular convention-goers for other types of science fiction, fantasy, or anime cons. As my informant Daniel Holzman-Tweed explained to me, “I grew up in science fiction convention culture, and where it’s a perfectly normal thing to have friends that you see only a weekend at a time at a convention and they are the closest friends you have because for some reason you don’t have a local community.”3 The convention space, then, is a place to highlight and reinforce the subcultural values and relationships within the community. As much as the steampunk convention community caters to particular group interests, the existence of the con exists in tension between its immaterial subcultural value and the practical consideration of its financial solubility. Since the first steampunk convention – New York City’s SalonCon in 2005 – the rise of steampunk cons have grown exponentially; in 2011, I noted the existence of twenty-five cons, and this year, the number has bloomed to thirty-two.4 Many first-year cons sprout out in the hopes of gaining enough commercial value to continue the following year, but end up floundering because of low attendance rates or inexperience with event management. Last year alone, I’ve seen the birth and death of four conventions out of the last eight I had attended, though many more become resurrected from the ashes of old attempts, like fan-driven phoenixes motivated by clockwork dreams. Thus, although conceived as ephemeral events, the convention longs to be institutionalized by its creators by through its monetary success. The economic investment needed to facilitate a convention is not to be scoffed at; thousands of dollars, usually pooled from the pockets of a few dedicated people, are invested into getting one off the ground. Though de Certeau’s idea of a “gift” economy of tactical rebellion is prevalent in the individual interactions between steampunks, a convention requires compliance with the capitalist system. There are so many institutions that monetarily benefit from one after all: the hosting hotel or event space, the restaurants where attendees eat, the vendors who serve as backers for an fan-run conventions, the occasional business sponsorship for more ambitious ones. A majority of work that goes into establishing a con, however, a welcomed burden carried by the convention’s dedicated volunteer staff, who produce endless hours of emotional, affective, and subcultural labor that, if all goes well, results in one successful weekend out of an entire year. Amid this contradictory mix of romantic and realist goals, steampunk conventions, then, provide a space where its participants can enact their dreams of utopia. The con is not a valve, a break from the world of the everyday, but, at least for a portion of steampunks who decide to live a steampunk lifestyle, this space is an idealistic manifestation of the everyday. During my interviews with steampunk participants, the idea of the con as another home for its participants inevitably comes up. At a fair, steampunks can go “walkabout,” wander, meet and interact, establishing in a sense of communitas outside of its institutionalized constraints. The bonds participants form in a convention space, a haven for the unconventional, may be one of the most important ones we have. As anthropologist Michael Jackson points out in his book At Home in the World, “Home is always lived as a relationship, a tension.”5 As a performer who has been on the convention circuit for several years, the con has become my second home, and the regular faces I see circulate on staff and in creative circles that travel to conventions for work and for hobby become second family. And it is with family that you share the most important moments of your life. I stood in the wings of the stage at TempleCon, a gathering in Rhode Island in February of 2010. I was a nervous wreck but at least I looked fabulous. 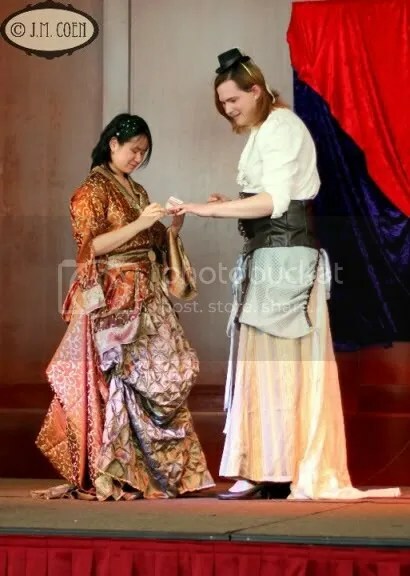 Months beforehand, I agreed to model for Festoon Butterfly and the designer Angie Carter created the outfit I wore: a sumptuous ballgown made out of printed silk, a fusion of Asian and European styles. A modified-robe, interlaced with a pattern of gold threaded vines over a shimmer brown background, draped over my shoulders and flowed down my torso. The voluminous skirts were sewed from pin-patterned fabric of lustrous olive green. Matching cording draped my waist, and the violet-green-blue eyelets of peacock feathers were tucked in my hair. At a convention where I’d be running from one panel to another amidst crowded hallways, billowing skirts were never an option for my walkabout wardrobe. Yet being a model proved to be a rare exception to my usual tomboyish steampunk attire, and for once, I was especially glad to display this finery. The plan was hatched last-minute in a fit of serendipity more than anything else. The performance troupe I was with at the time were all told of this the day before to make an announcement at the end of the Fashion Show at TempleCon. In a side pouch, the dragon-crested one I usually carried as part of my con gear, I had packed the small velvet box, and I compulsively checked to reassure myself it was still there. My fiancée Ashley was also modeling for Festooned Butterfly and donned an Edwardian-style walking dress with a leather corset and a lacy miniature top hat. After the other designers’ models swept the stage, my friends called up both of us the stage one last time. Ashley had no idea what was going on, and the MC had to turn her around to face me. I told her that Vietnamese New Year had just happened, the year of the Cat, and this was the time for new beginnings. We’ve already celebrated our official engagement with my family but I added, with a smile, how Ashley had been asking for a year when she’d get her own ring (she deserved one too, being a woman). And then I went down on one knee of my own and asked if she would marry me. Jackson writes that “Homeplaces are the spatial correlatives of the moments that have changed our lives.”6 In that moment, the memory of my marriage proposal became tied to that physical hotel ballroom in Rhode Island, but not really: I proposed only on that physical stage, but also in that realm of the con space, a migrating destination, but also a place that had become my home. I’ve never shied away from saying that it was my fiancée who had first introduced me to steampunk. Outside of the steampunk community, having a transgender partner in the “real world” has been frustrating, enraging, and at times, frightening. The best solution we’ve learned over the years is to walk away from potentially dangerous situations, and not to go into areas where we’d be targets. In New York City, however, that’s been a big problem, especially in the socially conservative Harlem neighborhood where we lived together when we first arrived in the city. Racial tensions and class differences complicated how we were viewed; in a working class neighborhood, we were seen as the gentrifying villains, especially with the stereotype that all queer people and Asians-Americans are wealthy, although we suffered the same financial hardships that everyone else around us did. Over time, I was lucky enough to gain a modest but steady income, but it wasn’t enough to support two people. Ashley, working as a barista at Starbucks faced taunts, threats, and disrespect by customers on a weekly basis, and often came home late nights physically and emotionally exhausted. During our first year in New York living together, the specter of violence seemed to haunt the back of my thoughts. We were both women and seen as vulnerable in our own separate ways; when alone, we’ve had to avoid unwanted advances, catcalling, and people following us on walks home. But in my head, I feared something much worse for my trans partner, because she stood out much more as a target. No matter where we traveled in the city—whether it was Harlem or Fifth Ave or Times Square—our vulnerability hadn’t changed. People say New York is the city where everyone can find their home; in reality, the city is a segregated space defended by the urban tribes dwelling within it. We weren’t finding our home for us no matter where we went. Finally, after months of hardship, both emotionally and financially, we decided that the best solution was for Ashley to move back to Massachusetts. We hoped that someday we’d be able to live together once we gained her financial footing back. For the past three years, we’ve been living separately and maintaining a long distance relationship. Neither of us have a large income for travel, but really, the thing that has helped us so much was the steampunk community. Going to conventions started to coincide with having a chance to be together in a space with our friends and without the abuse that everyday life usually inflicted on us. The convention space became synonymous with home. The space migrated, venues changed, some con experiences were better than others, but no matter were we were in the country, at a convention we knew we were safe. “Home is a double-barreled word,” Jackson observes. “It conveys the notion of all that is already given—the sedimented lives of those who have gone before—but it also conveys a notion of what is chosen—the open horizon’s of a person’s own life.”7 I think it is no coincidence that steampunk community – one fascinated with history, lineage, and the path of progress – is the one we had chosen to be our second home. 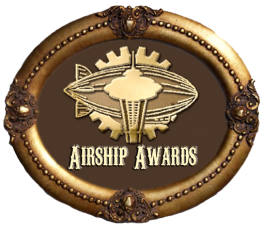 The steampunk community—our friends, and our allies—have been there for us in ways that even our own families have lacked. It’d be an exaggeration to say that only steampunk has made our relationship possible, and a discredit to the endurance of our relationship and the many non-steampunk friends and supportive spaces we have elsewhere. What I will say, however, is that without finding a strong queer presence in this community, we wouldn’t have stayed. At TempleCon, Ashley and I left the stage arm-in-arm. As we passed beneath the stage lights to the uproarious cheers of friends and strangers, we traversed – betwixt and between – various worlds in our establishment of home. Our relationship had blended the private and domestic with the political and public in this doubling of imaginative and actual realities. To me, home exists as a multiplicity. First, as a feeling of completeness in another, which is represented by the rings sitting on our fingers. Moreover, though, home is an ephemeral moment that is embodied by a physical and conceptual place that exists connected to and yet separate from this hotel ballroom in Rhode Island. The Neo-Victorian gown I wore when I proposed to my fiancée I later bought from Angie, who gave it to me at a generous discount. She said she couldn’t imagine it belonging to anyone else. 2 Susan Stewart, On Longing. Narratives of the Miniature, the Gigantic, the Souvenir, the Collection, (Durham, NC: Duke University Press), 20. 4 Ay-leen the Peacemaker, (Diana M. Pho), “Gearing up for 2012: A Steampunk Conventions Listing,” Tor.com, January 19, 2012, (http://www.tor.com/blogs/2012/01/steampunk-cons-2012) Accessed: April 25, 2012. 5 Michael Jackson, At Home in the World, (Durham, NC: Duke University Press), 122.